Home » Uncategorized » Wonderful Wedding! So we just got back from Jackson, Wyoming where we traveled for our son’s wedding . . . absolutely unforgettable!! We LOVE our new daughter-in-law Lindsay (and her family, too) and couldn’t be happier for our son Alex! 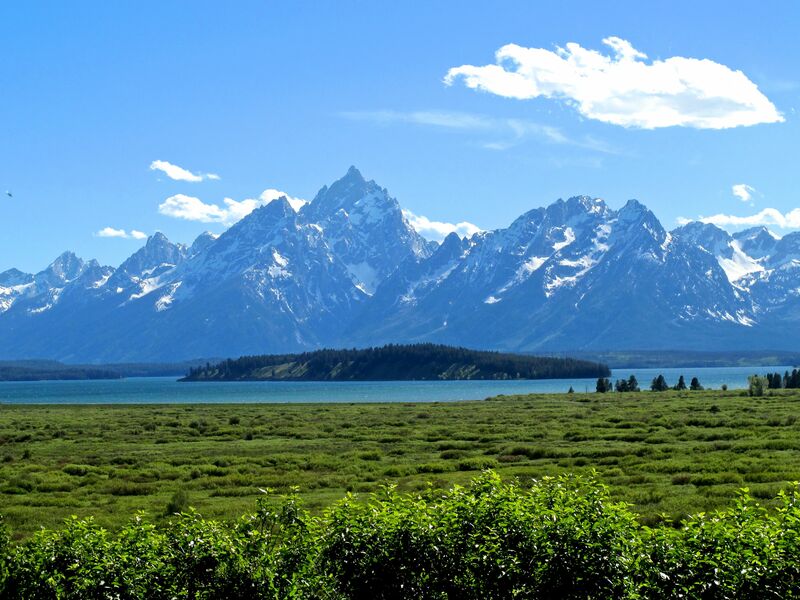 And they sure made a great choice on wedding venues–the Grand Tetons were quite a backdrop! Then, there was the food. Honestly we didn’t have a bad meal the whole time we were there! One of my favorites was the reception dinner at the Granary . . . I had the Cajun Spiced Elk Tenderloin with New Orleans Butter Sauce, Manchego Mashed Potato Truffade and Organic Baby Carrots . . . YUM! Other great restaurants: the Lotus Cafe was outstanding with plenty of vegetarian and gluten free choices; the Backcountry Deli was just delicious with a great assortment of sandwiches and a very toothsome potato salad; and I can’t say enough about Nora’s where my father-in-law treated us all to the best grilled trout ever! Unfortunately, I didn’t get any good food photos because I was too busy eating! But here’s a photo of Jackson Lake and the Grand Tetons. Cooking Good featured in the “Chef de Tucson” column of the Arizona Daily Star!